*Straightens hair, while moisturizing and restoring its health. *Balances the hair's natural pH leaving it silky soft and shiny for up to four months. This is the new Bien Brasil Cacau, its formula is already approved worldwide by Brasil Cacau clients and Salon professionals. 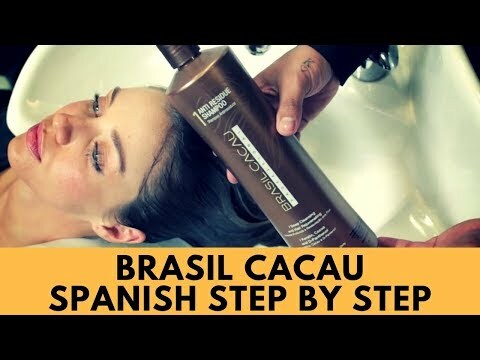 Now, this Brasil Cacau has a new bottle and a new hydration component that replenishes the dry chemically damaged hair. Bien Cacau delivers straight, soft, shiny results to all types of hair. Use: With wet hair, apply a sufficient amount of Shampoo Antirresíduos gently massaging the hair, rubbing in the opposite direction across the wire extension. Rinse and repeat this process two more times. Rinse thoroughly. Dry the hair with the aid of a dryer, apply the Brazilian Keratin Thermo around the hair root to tip direction, a minimum distance from the root. After product application, the hair dryer 100%. Take a brush and the iron, divide the hair into thin strands. Rinse. On wet hair, hydration uniformly applies the mask for the whole length of the wires, spreading the keratin well root to the tip direction. Let stand 3-5 minutes and rinse. Finish as desired. THIS PRODUCT WILL BE SENT BY DHL EXPRESS AND YOU WILL GET IT BETWEEN TWO AND THREE WORKING DAYS AND YOU DON'T NEED T PAY ANYTHING EXTRA! !